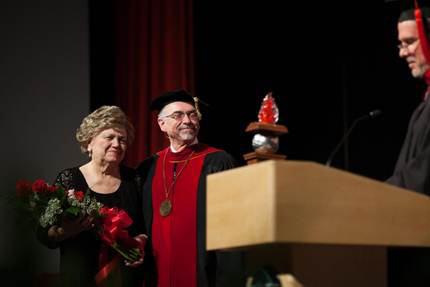 Dr. Ronald and Barbara Manahan receiving several recognitions from the Grace College & Seminary Board of Trustees. Commencement ceremonies at Grace College & Theological Seminary took place Saturday, May 11 at 9 a.m. in the Orthopaedic Capital Center on the Grace campus. A brass ensemble conducted by Martin Becker provided the prelude and processional accompaniment. The ceremony, which commemorated the 75th anniversary of the college and seminary, included an invocation by Michael C. Taylor, director of the medical and compassion ministries of Encompass World Partners-Three Strands and father of Kristen H. Taylor, graduating senior. An institutional recognition was also given by James L. Custer, chairman of the Grace board of trustees and Ronald E. Manahan, Th.D., president of Grace College and Seminary led the commencement ceremony. The musical presentation was performed by graduating senior Rebekah Noack, accompanied by Aaron Scantlen. Matthew D. Slippy gave the benediction. Slippy is associate pastor of Youth and Family Ministries at Calvary Baptist Church in Cedar Rapids, Iowa, and father of Tara A. Slippy, graduating senior. Thirty-three members of the Class of 1963 also participated in the ceremony as “Golden Grads.” They marked their 50th class reunion during the weekend. Click here to see photos from the Golden Grad Reunion. 18 received Doctor of Missiology degrees from Grace Theological Seminary. There were 33 “golden grads,” members of the Class of 1963, who celebrated their 50th class reunion on graduation weekend. They preceded the Class of 2013 into the OCC. The class was comprised of students from 24 states and 16 countries, including Argentina, China, England, France, Germany, Hungary, Mexico, New Zealand, South Korea, Spain, Taiwan, Uzbekistan and the United States. Of the 431 college graduates, 36 were members of the Alpha Chi Honor Society and six were the college’s first inductees into Sigma Beta Delta, an honors society for business students. A total of 163 baccalaureate degree recipients earned graduation honors and wore gold tassels, cords or sashes at the commencement ceremony.